How would a new legally binding international instrument that seeks to define the principles of environmental law influence ongoing efforts to strengthen the protection of the environment in relation to armed conflicts? 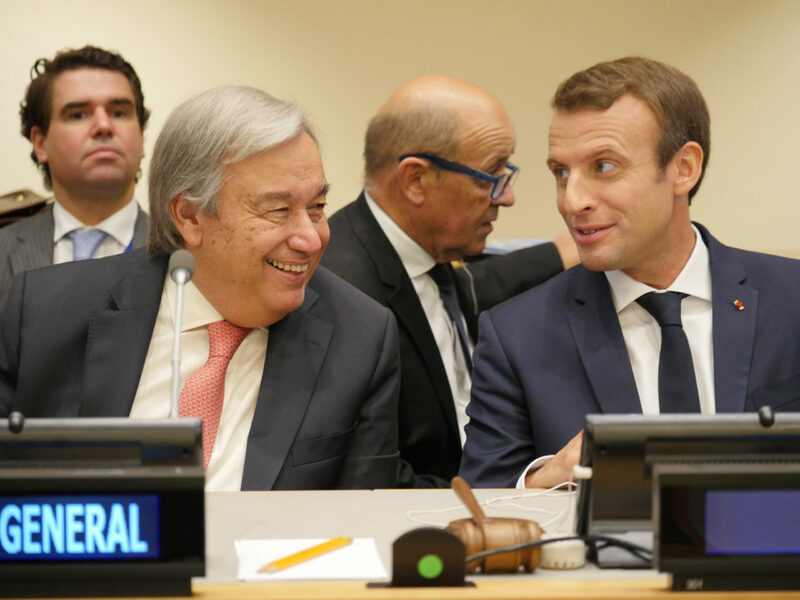 UN Secretary General António Guterres and France's President Macron at the UN launch of the Global Pact for the Environment in 2017. It’s looking increasingly likely that an ambitious initiative to create a legally binding global agreement enshrining the principles of environmental law will go ahead, perhaps as early as next year. The proposal for a Global Pact for the Environment is dividing observers, for some it is an overdue and urgent project to strengthen global environmental governance. For others, it risks undermining the carefully crafted and hard fought language of hundreds of multilateral environmental agreements. The draft text of the Pact includes a principle on the protection of the environment in relation to armed conflicts and this blog takes a look at what the implications of the Pact might be for the developing topic. On May 10th, 143 states voted in favour of establishing a working group to develop French proposals for a legally binding Global Pact for the Environment. Six states, including the US and Russia, voted against the resolution, which was sponsored by nearly 100 countries. President Macron hailed the vote as “a new step for the protection of the environment” but others were less enthusiastic, with the US opposing it on the grounds that the resolution purported to “…prejudge movement towards a “Global Pact for the Environment” when the concept remains ambiguous, and member states have not yet considered the merits of such a proposal or how it would contribute to the existing international environmental regime.” Russia also bemoaned what it viewed as a lack of consultation, and argued that the world’s priority should be the more effective implementation of existing environmental agreements. Buoyed by the successful negotiations for the Paris climate change agreement, and with Macron pursuing a revitalised international agenda, the vote comes just nine months after France presented its plans for the Pact to a high level meeting at the UN. France argues that the overarching purpose of the Pact is to fully enshrine the core principles of environmental protection in international law, and in so doing give them additional legal and normative force. What is the purpose of the Pact? The proliferation of multilateral environmental agreements (MEAs) without coordination has resulted in inconsistencies between parties’ obligations. A number of UN bodies have cross-cutting mandates on environmental and sustainable development matters, without a common body of law to inform environmental governance. There are many coordinating and governing bodies for MEAs that also lack a common reference point for their guiding principles. Non-binding international declarations of environmental principles cannot necessarily be relied upon in courts. The extent to which national constitutions have adopted environmental principles varies widely and the Pact would therefore supplement this in those states that are yet to enshrine them. It would assist with the integration of the different bodies of public international law. The Pact would be a living document whose principles would be clarified over time as they are interpreted by states and courts; it would also contain a non-regression principle that would stop courts from weakening laws. This month’s UN General Assembly vote, and with it the apparent backing of a large number of states, has helped to give the impression that substantive work towards a new instrument, perhaps as soon as next year, is now inevitable, in spite of the objections of some countries. The initiative has also received the backing of some large environmental organisations, such as WWF and the IUCN, and is supported by UN Environment. However, many experts and civil society organisations remain sceptical of the initiative. Beyond the suspicion of the influence of states and large organisations on the process thus far, the Pact as proposed raises a number of legal concerns. These have been focused on a key question of whether the fragmentation and diversity of environmental law is a weakness, or a strength that has helped provide flexible solutions to context-specific problems. It is also the case that the formulation of many of the principles in the draft Pact varies from instrument to instrument, largely because they are context-specific. This applies even to fundamental principles such as Polluter Pays, Precaution and access to information. The Pact’s authors argue that they sought a diversity of views to identify language that was likely to meet the widest possible approval from states but as the final negotiated outcome will be adopted by consensus there is scope for keystone principles of environmental law to be watered down. In which case, how will the Pact relate to existing agreements? If it overwrites them then it clearly has the potential to be regressive, rather than progressive. And if states argue that particular areas of law are lex specialis then what is the added value of the Pact? Furthermore, how will the Pact be implemented and enforced? It’s notable that the two agreements that its author’s seek to model it on – the International Covenant on Civil and Political Rights and the International Covenant on Economic, Social and Cultural Rights – have questionable enforcement mechanisms. What does the draft Pact say about armed conflicts? The expert group who reviewed the draft Pact in 2017 included the former Special Rapporteur for the International Law Commission (ILC) on conflict and the environment Dr Marie Jacobsson. But while draft Article 19 is brief, it has the potential to be highly contested by states. Firstly it goes beyond international humanitarian law to consider all states’ applicable obligations under international law – Rio’s Principle 24 did likewise but was non-binding. But while this fits with both the definitional problems of identifying when an armed conflict begins and ends, and the previous work of the Commission on the non-termination of treaties by armed conflicts, it will prove controversial for some states that view international humanitarian law as lex specialis. It also introduces the concept of protection in relation to armed conflicts, which should include preventative measures before conflicts, such as developing national environmental standards or reaching agreements over designating and avoiding harm to protected areas, as well as remedial and restorative measures post-conflict. While these themes will be very familiar to those following the ILC’s work on the Protection of the environment in relation to armed conflicts, it is also readily apparent that no consensus has been reached among states on some of these issues. As the proposed timetable for the Pact will see it negotiated prior to the suggested conclusion of the ILC’s study, those advocating for Article 19 as currently drafted will need to draw on the incomplete outcomes from its work to date. Will the Pact add value or be counterproductive? The law protecting the environment in relation to armed conflicts is a case study in fragmentation. International humanitarian, environmental, human rights and criminal law are all potentially applicable – if underutilised – and this fragmentation and lack of definition was one of the motivations for the ILC’s study, which began in 2013. Could the Pact help in its process of enhancing legal protection? On the basis of the proposed draft Article 19, the answer is a cautious “yes”. Providing formal legal recognition of the applicability of all obligations stemming from international law, and not just international humanitarian law, would be a valuable and overdue step forward. Similarly the further strengthening of the principle that protection is an obligation not just during conflicts but in relation to them would also help recognise the consensus view of the majority of legal experts, as well as reflect a growing body of practice from states and international organisations. Should it be negotiated and agreed prior to the conclusion of the ILC’s study, the Pact could also help to endorse the ILC’s own and far more detailed draft principles on the protection of the environment in relation to armed conflicts. However conversely, the exclusion of armed conflicts from the Pact in the face of objections from states, or serious challenges to what amounts to the essence of the ILC’s study in the article on conflicts, could have serious implications for the successful conclusion of its work. Whether it is during the working group that has been established by this month’s General Assembly resolution, or during any negotiations that follow, it seems unlikely that the potential impact of Article 19 will go unremarked on for long. Those progressive states that wish to see the legal framework protecting the environment in relation to conflicts made fit for purpose will need to fight to protect both the proposed language, and potentially the continued inclusion of any principle on armed conflicts in the Pact. While Macron may have sought to revitalise French foreign policy, past evidence from the debates on the work of the ILC’s suggests that the Pact’s sponsors may not be the greatest advocates for the continued inclusion of draft Article 19, nor for its protection. Speaking in the UN Sixth Committee debate on the ILC’s study on conflict and the environment in 2013, the French delegation “…reaffirmed the doubts expressed earlier on the feasibility of work on such an issue, the objective of which was not apparent.” The question is whether other states, international organisations and civil society will step up to the task if France doesn’t. Doug Weir is the Research and Policy Director at the Conflict and Environment Observatory.